Application of geochemical modeling, frequently also coupled to reactive transport modeling, became an important part of many hydrogeological and geochemical investigations. 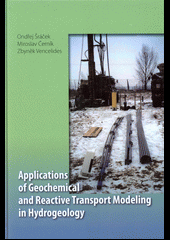 This text intends to present some basic and typical applications of geochemical and reactive transport modeling. As stated in the title, focus of the text is on the modeling of geochemistry and reactive transport. This means that flow modeling and conservative tracer transport modeling principles are presented here only at the levels necessary for applications of geochemical and reactive transport types of modeling.